The first large warship to sail from the Gareloch to take part in the Joint Warrior 091 exercise was the United States Navy's destroyer PORTER, a member of the 'Arleigh Burke' class. One of the US Navy's 'Ticonderoga' class guided missile cruisers is also taking part. PHILIPPINE SEA first visited Plymouth before heading north to Faslane to join the other ships. On her way caross the Atlantic, PHILIPPINE SEA was involved in the evacuation of a sick passenger from the cruiseship BRAEMAR. 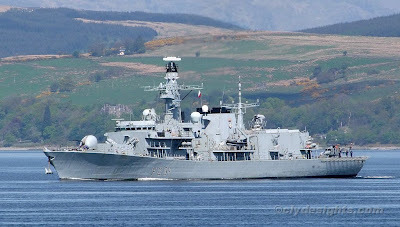 The British frigate ARGYLL, now the oldest Type 23 'Duke' class ship in service with the Royal Navy, was the only warship noted passing Cloch Point with an aircraft - an Agusta-Westland Lynx helicopter - embarked. Hi , the doc on the Philippine Sea also came to the rescue for a seaman on board the German minehunter FGS Hameln M1092 who had a sore leg on the way out through the North Channel on Monday , all in all they have been busy.